We have two male rescues, Charlie (shih-tzu) and Keko (poodle) that unfortunately like to mark, and the belly bands have helped immensely. Our boys think nothing of having to wear the bands, they get put on whenever we leave the house and it's become part of our daily routine. They actually come up to us when they know we're getting ready to leave the house to wait for them to be put on because they know that's always followed with a snack.Thank you so much for this wonderful product, I honestly don't know what we would do without them! I really love all of your photos and testimonials...the photos are precious! Dogs rule!! I love the Belly Bloomers.They couldn't have worked any better. I had been looking for years for something just like these Bloomers. Beauty & Janet, Oklahoma. Lesley, Thank you so much for such a wonderful product. The bands are made very well and fit my dog just right. I didn't want something that would rub on his legs and the material you use is just great. Not only is this a wonderful product the customer service is the best.I received the bands in just a matter of a few days. My first order was for three and I just placed an order for three more and referred my sister who is ordering the girl bloomers. Thank you again. Deezel and Pat,Virginia. We received the Belly Bands and just LOVE them. They are a life saver! They fit Baylee perfectly and keep our carpets clean. Thank you so much, Baylee and Jamie, Ohio. The Belly Band has saved us more than a few times already. I really appreciate you going the extra mile to do the velcro for me. (Tyson's dad is currently serving our country in Iraq. )Tyson and Amanda, Georgia.. The Belly Bands are such a lifesaver. If we go somewhere I don't have to worry about them marking anymore, we can all relax. Thank you again. 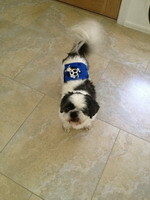 Bodhi and Bentley, Florida..
Hi, My name is Matty and don't I look handsome in my belly band? 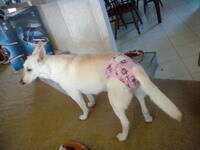 Yes, I like to mark my territory so Mom has been ordering my belly bands from Aunty Lesley for awhile now. Each belly band is made with tender loving care, great quality and we love the selection of fabrics!!! Mom will never order from anyone else - my belly bands arrive promptly. Mom and I are so happy and boy am I comfortable for they are made exactly to fit me!! Matty and Sandy, Massachusetts. 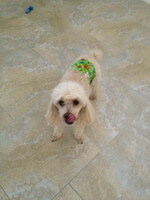 Here’s a pic of Truman wearing his Pet Shoppe Boutique belly band. 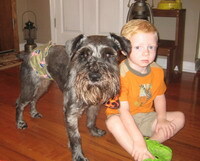 Wearing the belly band, along with an “overnight” incontinence pad, gives him the freedom to roam all over the house without worrying his Mom about accidents due to his paralysis. Pattie & Jim, Arizona. 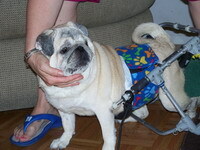 Gizmo was attacked by a large dog and suffered severe injuries. Staples, sutures and drains were placed to heal his wounds. 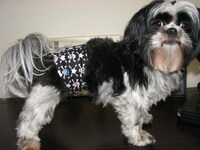 The Belly Band and Bloomers helped to protect the staples and drains, an e collar was not needed. We are happy to report Gizmo has made a full recovery. Gizmo Griffiths - Grand Rapids, Michigan. 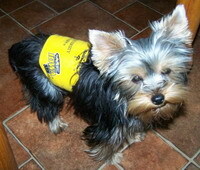 I just adopted male yorkie 'Wookie' from a rescue group (who got him from a puppy mill) and he is not housetrained. The belly bands are literally life-savers! If I didn't have the belly bands, I would not have been able to adopt my little guy and give him a forever home. And the Pet Shoppe Boutique belly bands are so adorable, with all the different designs and fabrics, it's almost like Wookie has his own wardrobe. I had a large order, but it was delivered only a few days after I submitted it. Catherine B. Tampa, Florida. Great Belly Bands,They look adorable in them, we just love them. Thank you. Riley, Rudy and mom Coleen, Pennsylvania . Beautifully made, high-quality product & selection is truly "Awesome". Additionally, am impressed with the speedy service. Thank you. Nikki-Michigan. Just thanking you for excellent service! I received my order yesterday. I wish I had looked online before going to the Pet store and paying $22.00! Thank you! Kandy-Indiana. My miniature schnauzer started marking in the house after my husband and I had a baby. I bought a belly band from you and we love it. I have not found one place where he has marked since I received the belly band. The shipping was fast and the product is great. Now can you come out with a product to train my husband to clean the house? Thank you, your a life saver. Hops & Colton -Tennessee. I love these belly bands! I have tried others, but these don't irritate my pomeranian, Mozart. They are well made, come in great choices of fabrics and Lesley ships them out fast. She also responds right away if you have any questions. I will definitely buy from her again. Jill & Mozart - Oregon. I cannot tell you how happy we are with these belly bands. I had a breeder suggest using these but was not able to find any until I found your website. They are a big help with potty accidents and keeping our carpets clean and when visiting friends and family. I am sure I will order more in the future. Beth & Harlee-Iowa. Pommy loves his new pants! Your belly bands are the nicest and at the best price. You have so many darling prints to choose from too! Thank You, Karen and Pommy - Pennsylvania. We've found your belly bands a "home saver!" Our little guy insisted on marking his territory and we were getting pretty tired of the clean-up. With the belly bands we're off patrol and we're on our way to breaking his habit. They fit beautifully and he's comfortable wearing them. Edie and Sparky, New Jersey.